Do people tell you to straighten up? Poor posture can take many forms. Are you starting to look like one of these? Experiencing a rounded back, hip or shoulder unlevelling or maybe even some rotation in your torso or pelvis? 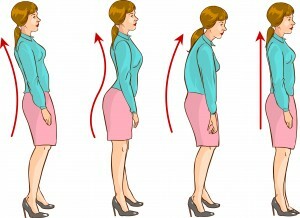 It seems obvious that poor posture equals back pain, but how does one develop poor posture? From a chiropractic perspective, poor posture all starts from too many stuck stress responses trapped in the Central Nervous System. When too much stress is perceived from either the internal or external environment, the body launches a sympathetic stress response to ensure survival. What happens to us mechanically during a sympathetic stress response is that we undergo a reflexive, flexion response. Much like a cat arching its back when scared, we curl up or flex the spine when stressed. This flexion response causes musculoskeletal changes that lead to something chiropractors call Spinal Subluxations. These are adaptive responses that the body has developed to deal with the stresses in the environment. When we encounter a major stress or experience prolonged stress originating from whatever source, the body elicits a physiological, sympathetic stress response of fight, flight or freeze. The stress response causes us to adopt a flexion type of posture. The body compensates for the increased stress in the system with spinal subluxations. These spinal subluxations adaptations are what pull and rotate the spine out of alignment leading to hip and shoulder unlevelling. They aren’t bad but subluxations eventually hurt! The best way to correct poor posture is to release the stuck stress responses in the CNS and engage in regular, proper strengthening and stretching of key postural muscles. Starting Tuesday, March 21 at 5:00 pm at my clinic (located at 10432-123 Street) I will be teaching a Back Care and Posture Class. The class is small allowing me to have more one on one time with participants. The first ten people to register will receive a complimentary discovery session with me ($65 value). Reserve your spot today to catch the Early Bird pricing.